In Ecuador we celebrate Holy Week from Palm Sunday until Easter Sunday, dates that are counted 40 days after Carnival, in this 2019 they coincided on the dates of April 14 until April 21. This week is one of the most representative of Christianity with deep commemorations of its parishioners. In each region, city and part of the country, it is celebrated in a diverse and colorful way. Among other things they have religious rituals, parades, passion games and religions are performed. In the country we have many traditions which are fulfilled during Holy Week, among the best known we have: visit seven churches, prepare the Fanesca (a typical dish) and the largest procession in the country of Jesus of the Great Power. Holy Tuesday: Jesus anticipates his disciples the betrayal of Judas and the denials of Saint Peter. At that time, Jesus deeply said: "I assure you that one of you will deliver me"
Holy Wednesday: Judas conspires with the Sanhedrin to betray Jesus for thirty pieces of silver. And since then he was looking for an auspicious occasion to deliver him. Holy Thursday: This day we remember the Last Supper of Jesus with his apostles. We also remember the arrest of Jesus, which was after the Last Supper. Good Friday: This day we remember the Passion of Our Lord: His prison, the interrogations of Herod and Pilate; the flagellation, the crowning of thorns and the crucifixion at 3:00 pm, in which the death of Jesus on the cross occurred. Sunday of Resurretion or Easter Sunday: This day we celebrate that Jesus rose from the grave. Fanesca is a traditional dish to eat during Holy Week. This soup is prepared with dried cod and 12 different grains. It is said that the fish represents Jesus and the 12 grains represent the disciples. The ingredients of the Fanesca are: pumpkin, zambo, beans, chochos, corn, peas, beans or beans, rice, onion, garlic, cumin, achiote, peanuts, milk, cream and cheese. You can also add some vegetables like dad and banana. The tradition is to eat the Fanesca on Holy Thursday, like The Last Supper. However, the dish is known to be prepared nationally, during the whole week and that's why you can get it all week in several restaurants. It is usually served hot on a plate and it is traditional to decorate it with pieces of cod, whether cooked or fried, salt doughs in the form of empanadas, threads, or small balls. Also fried ripe banana, red chili peppers, parsley leaves, fresh cheese, a piece of white onion and slices of boiled eggs. Although at present there are variations in recipes to satisfy the tastes of diners. The procession of Jesus of the Great Power is a tradition of more than 50 years old. Around 250,000 thousand people go to the streets in the center of the city of Quito, in Plaza San Francisco. The procession lasts until three in the afternoon, the time of the death of the Lord. The descent is made at six o'clock in the afternoon, when the day ends for the Jewish community. 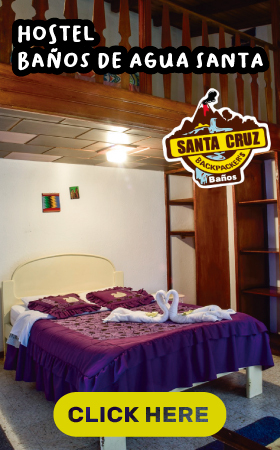 The cucuruchos, along with the Veronicas, are traditional characters that accompany Jesus of the Great Power and the Sorrowful Virgin in this journey that begins and ends in San Francisco and that covers a good part of the Historical Center of Quito. The whole city and the streets are filled with purple. 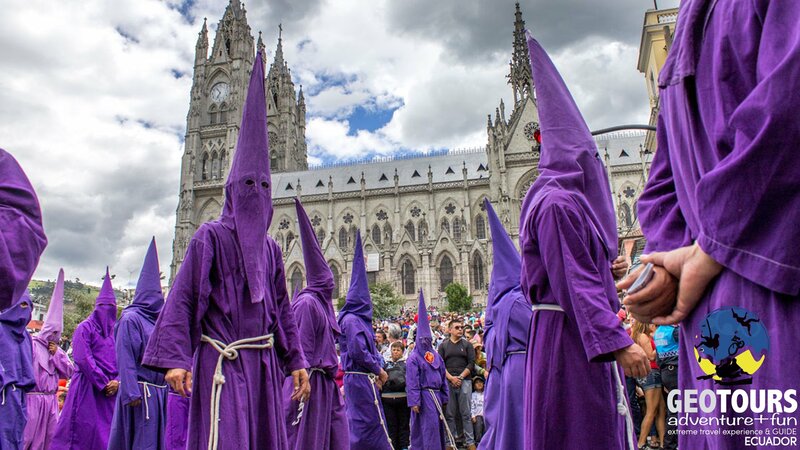 The Cucuruchos symbolize the penitents who show their repentance and their willingness to change and want to vindicate themselves and begin a life free of sins. The Veronicas are the representation of the courageous woman who made her way through it, to wipe the sweat and blood from Jesus' face with a cloth that would have been miraculously engraved on the cloth by the Holy Face. The cloth of the Veronica would be one of the relics that are considered vera icon. The tour of the seven churches takes officially place on the night of Holy Thursday. 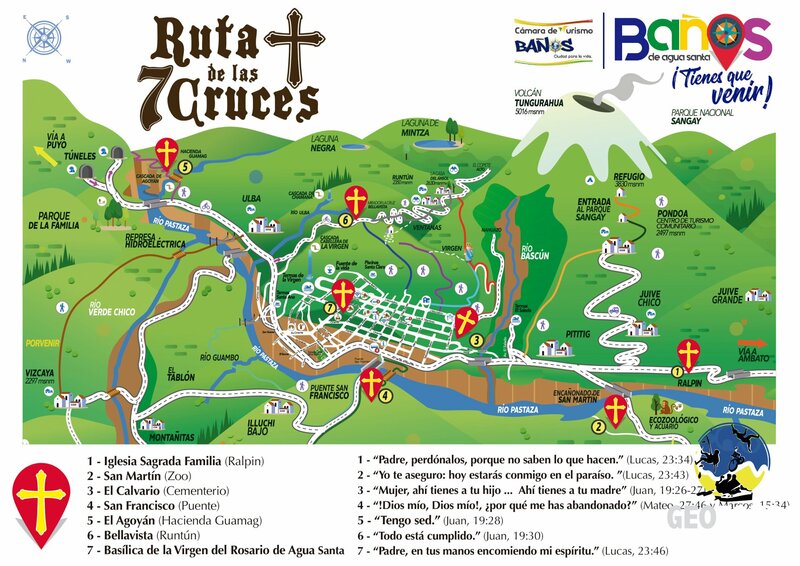 This is one of the most common traditions of Holy Week throughout Latin America, here are commemorated the seven journeys that Jesus made. Some think that the journey is made by the seven words that Jesus pronounced before he died. Others think that these visits symbolize the accompaniment of the faithful to Jesus in each of their journeys from the night he was captured until his crucifixion. The first church recalls the journey of Jesus from the Cenacle, where he celebrates the Last Supper with his disciples, to the Garden of Gethsemane where he prays and sweats blood. In the second church people meditate on the passage from the garden of Gethsemane to the house of Annas, where he was interrogated by this and receives a slap. In the third church, the prayer focuses on the journey of Jesus to the house of Caiphas, where he received spitting, insults and suffered pain throughout the night. The fourth church is the center of reflection for the fourth church is the first appearance of Jesus before Pilate, the Roman governor of the region. There Jesus was accused by the Jews who raised false testimonies against him. In the fifth church the Lord is accompanied in his appearance before King Herod, who together with his guards also revile him. In the sixth church, we meditate on the second appearance before Pilate and when Jesus was crowned with thorns and condemned to death. In the last, the seventh church, we remember the journey of Christ from the house of Pilate to the Mount Calvary carrying the cross on his back, his death and his passage to the tomb, from where he resuscitates on the third day. John 19:30: It is complete.